Imagine your life if you had a personal stylist who was responsible for doing all of your shopping. They would choose outfits that fit you perfectly, and all you would need to do was put on the clothes. What about a personal chef? They would know your dietary restrictions, cook your favorite foods, and have meals waiting for you when you got home from work. While a personal stylist and chef are luxuries that many of us cannot afford, what about a personal trainer? If you think about it, you get the exact same value: they help you to set fitness goals, plan workouts, and stay on track. All you need is the gym membership. 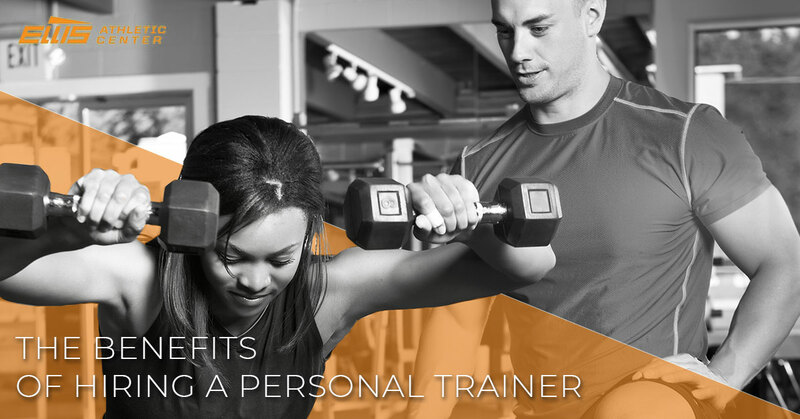 Unlike personal shoppers and chefs, personal training is actually affordable! Committing to personal training comes with a host of benefits which we’ve outlined below. To benefit from personal training in Newtown Square, contact Ellis Athletic Center today! Everything is better personalized. When you start personal training, you’ll notice immediately that the “personal” aspect rings true. Personal training is so much more than a coach encouraging you to do more push-ups. From the beginning, your trainer will work with you to make a customized fitness plan based on your fitness goals and lifestyle. Whether you want to shed a few pounds before a beach vacation or if you are training for an Iron Man, a personal trainer will develop an individual plan to maximize your time and effort. Gone are the days where you walk into the gym and spend 20 minutes deciding which machine to use, ultimately retreating to your favorite treadmill. Your personal trainer will have a plan for you, so you’ll waste less mental energy on planning your workout and spend more time getting into shape! If you’re prone to injury, have any specific condition that makes it harder to workout, or if you’re recovering from an injury, personal training is absolutely the route to go. Not only will fitness coaches tell you which exercises to avoid and which ones will help, but they will also teach you how to do an exercise correctly. Those machines that were once intimidating to use will now become a routine part of your workout. Your trainer will hold you accountable to good form in every exercise you do, helping to prevent injury and build strength. If you’re concerned about the price of a personal trainer, think about the proverbial “giving someone fish to eat” versus “teaching someone to fish.” When you invest in a fitness coach, you learn lifelong fitness skills that will pay off long after your personal training sessions end. You won’t just learn the proper form for a bicep curl. You’ll also learn how to plan a well-rounded exercise routine, starting with a dynamic warm-ups and ending with a proper cool down. You’ll know when to plan leg days versus arm days, or how to get a full-body workout in a short period of time. Fitness coaches hold you accountable to your fitness goals. This is actually a primary reason why many people do not hire a fitness coach — it can be scary and intimidating to sign yourself up for something that will push you physically and mentally. Ask anyone who has stayed true to a routine with a fitness coach, though, and they’ll tell you that the hard work was absolutely worth it. Plus, hiring a fitness trainer doesn’t mean you’re signing yourself up for boot camp. Your trainer will never yell at you. They’re professionals who are experts in kinesiology and motivation. The advantages of personal training are clear. To give this experience a try, sign up for a complimentary personal training session in Newtown Square. Have any questions about personal training? Contact Ellis Athletic Center today for more information.